We were treated to a crashing thunderstorm this evening, a summer tradition after a long, hot day. Up until about six o’clock, it did not feel like impending rain even though the cloud cover had increased to a deep overcast. Then, it got suddenly darker and, boom! The thunder commenced. Storms usually pass by us at a distance of two miles or more (based on the delay between lightning flash and thunder clap) but this one was closer, a mile perhaps. Consequently, the thunder was very loud and literally shook the windowpanes. It was dramatic and very exciting. Like a typical storm, the light and audio show carried on for 15 to 30 minutes before the rain began. And when it finally started, it was as if the rain were trying to make up for lost time. It intensified from a light sprinkle to a raging downpour in an instant and then dumped a huge amount of water in a short time. Deluge is the word that comes to mind. Such intensity cannot last, however, and soon the rain slowed to a steady fall, eventually tapering to a mist and finally trailing off. By eight o’clock, the storm was over and the clouds cleared out. Judging by the rise in the level of the swimming pool, an inch of rain fell in about two hours. While the storm itself was not unusual (they inevitably occur after heat spells), such a high rate of rainfall is rare. The good news is that we will not have to water the garden for a few days. The not-so-good news is that the rain fell much faster than it could drain away from the garden. 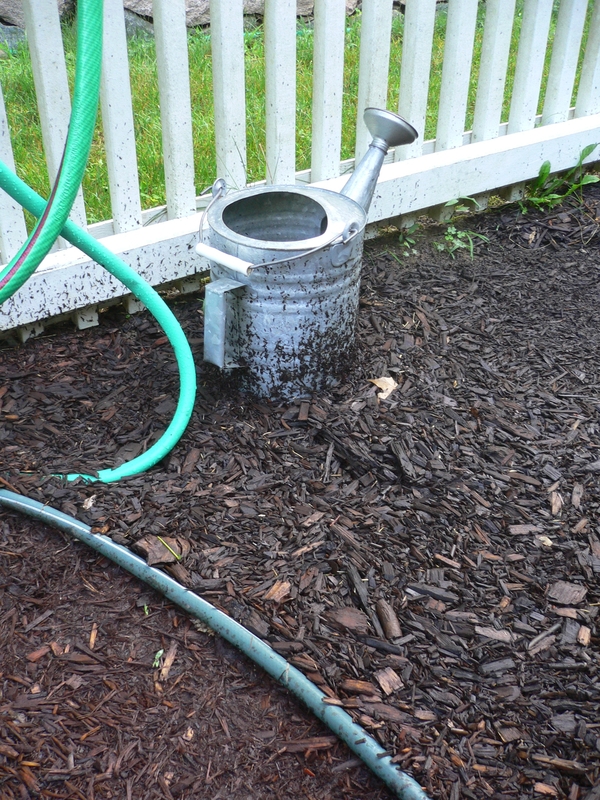 When we went down to the pool for a late night swim—and garden inspection—we found that the mulch had been redistributed by the flowing waters. One of the only downsides to cedar chips is that they float. The surface runoff did not cause any damage and no mulch or debris ended up in the pool, whose perimeter is higher than the surrounding areas. As we have learned too many times before, a benefit of raised planters is that the vegetable plants they contain are elevated well above potential floodwaters. No threat there (not this time, anyway). We do have squash and cucumber plants on the ground this year, though, and they are a bit more exposed. Fortunately, the squash plants were completely undisturbed; apparently, the water drained through the fence and out onto the lawn. 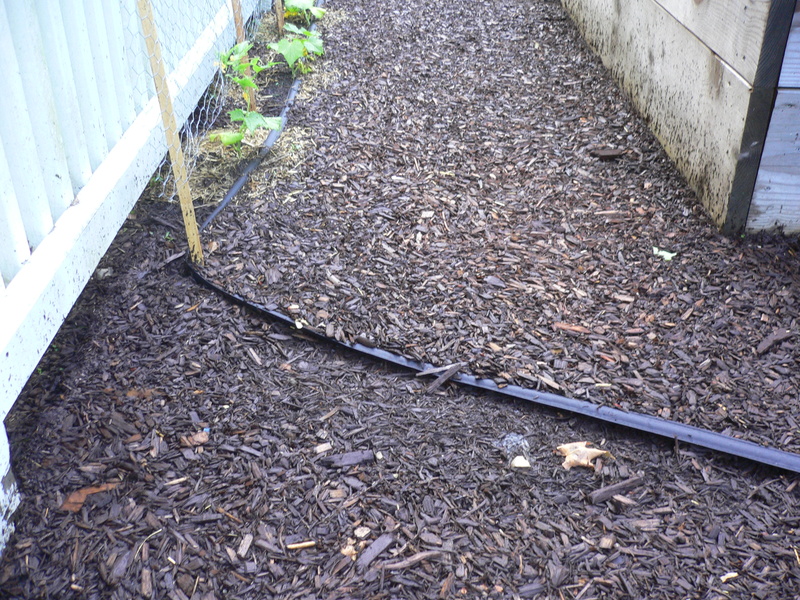 There was some impact to the cucumbers (they are located along the fence) but the soaker hose that waters them acted as a barrier; the plants look to be okay. 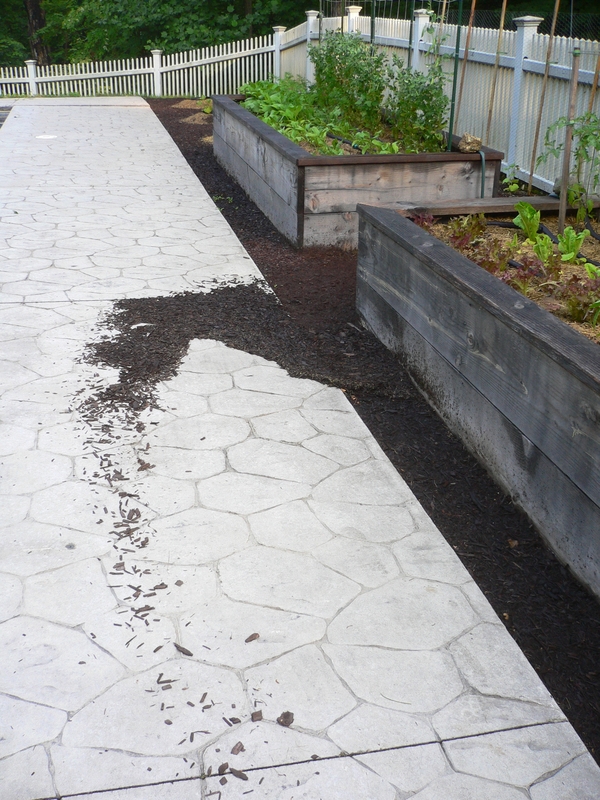 Still, the mounds of soil and mulch will have to be replaced. Luckily, storms of such intensity occur infrequently. Nonetheless, we will have to take another look at possible drainage improvements.